1. What Are the Train4sure Products? Train4sure offers various types of products, such as Questions & Answers, Practical Labs, Study Guides, Audio Guides, Exam Bundles, Certification Bundles. Let's take a closer look at them. Questions & Answers come in Train4sure Testing Engine. This is an interactive software that you can download to your computer. This tool provides interactive exam simulation with real exam questions and answers. This is an efficient and modern way to prepare for IT certification exams. Practical Labs are an online-based tool aimed to help customers prepare for lab exams. It provides you with hands-on experience without the expenses of purchasing expensive equipment. Labs allow for simulation of network setup, router configurations, switches placements etc. This is a great way to prepare for a lab exam. Study Guides available in PDF format. Train4sure Study Guides are a great addition to Questions and Answers. These comprehensive materials offer great insights and information that is highly useful to exam candidates. Audio Guides - convenient MP3 files can be downloaded on any device for efficient learning when you don't have much time. These are professionally recorded lectures on topics covered by your upcoming exams. Exam Bundles - a pack of all learning materials available for your exam. Depending on the exam, a bundle may contain Questions and Answers, Practical Labs, Study Guide and Audio Exam. What's important is that Bundles allow for great savings compared to purchasing the same products separately. Certification Bundles: Sometimes a certification requires candidates to take more than one exam. Certification Bundles include sets of exams required to achieve a certain certification. 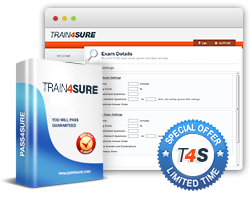 For customers willing to buy more than 3 exams, Train4sure offers a discount for "Custom Bundle". Please email at sales@train4sure.com and list all exams that you want to buy. We'll get back to you shortly! 2. What is the Testing Engine? Testing Engine is our proprietary interactive software that fully simulates interactive exam environment. We fill the Testing Engine with real questions and verified answers for your desired exam. Once you download and install the Testing Engine to your computer, you can start practicing in the interactive environment. The software allows for multiple modes and features. For example, you can use Training Mode, where you don't have a time limit, or set the time limit for your exam by switching to the Virtual Exam option. Furthermore, you have options to show or hide answers and do other adjustments to the software to enhance your interactive learning experience. This format of interactive exams is a popular and proven way to learn, so you can memorize things better, and benefit from real exam questions. 3. What is the difference between "Practice Exam" and "Virtual Exam"? When it comes to the Testing Engine, there are two different options available. In "Practice Exam" you can practice the questions and review the correct answers as you go. There is no time limit. Once you feel confident having practiced in this mode, you can switch to "Virtual Exam" which is the exact simulation of exam experience you will get in testing centers. 4. Will the Questions and Answers suffice? Will it be enough for me to pass the exam? Yes, studying with Train4sure Questions and Answers only is enough for you to pass an exam. However, it's crucial that you spend enough time preparing for your exam. We recommend that you study for at least 2 weeks before you attempt taking the exam. 5. Are Practical Labs questions included in Questions and Answers? Yes, they are. The Questions and Answers Products carry all exam questions, including the lab part of an exam. 6. How long can I use my products for? All Train4sure products have the validity period of 90 days from the date of purchase. After this time, when the 90 days are over, you will be able to extend the validity of your product by following the link in your Member's Area. You will also save 30% on your product price. You will not be able to use your product after it's expired if you haven't renewed it. 7. My product has expired. How do I extend it? When the 90 days of your product run out, you can renew it with a 30% discount. Simply follow the link in your Member's Area. Follow instructions to complete the payment. 8. How many Testing Engines can be Download if I buy Train4sure Unlimited Access? You will be able to download 10 Testing Engines per months, no matter how long (3, 6 or 12 months) your subscription is for. 9. How can I refund the Train4sure Unlimited Access Package? If you want a refund/exchange of Unlimited Access Package for 3 months, 6 months and 1 year will result in supplemental charges of $30, $50 and $70 respectively. Additional charges will be applied and remaining amount will be refunded for unused subscriptions. Train4sure Management reserves the right to deny the refund. 10. Am I able to exchange my subscription for 6 months or 1 year Purchased Package? Yes, you can do that. Subscriptions for 6 months or 1 year can be exchanged for quarterly subscriptions only. You cannot exchange them for monthly subscriptions.